Paleo Dog is your guide to optimal health for every dog, from the most pampered Teacup Poodle to the most rugged Mastiff, and every breed, age, and lifestyle in between. Paleo Dog covers a wide range of topics, including nutrition, of course, but also topics like vaccines and veterinary care, exercise, and alternative therapies such as Earthing, acupuncture, and herbs that are compatible with the Paleo Dog philosophy. It is science-based, understandable, and practical; its comprehensive scope and down-to-earth details will satisfy both pet guardians and pet professionals. 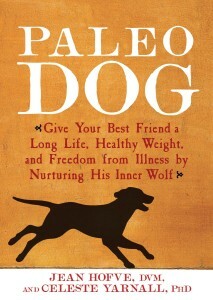 Order your copy of Paleo Dog now! * The Complete Guide to Holistic Cat Care: An Illustrated Handbook, by Celeste Yarnall, PhD and Jean Hofve, DVM, winner of the 2010 Muse Medallion award for best book from the Cat Writers’ Association.